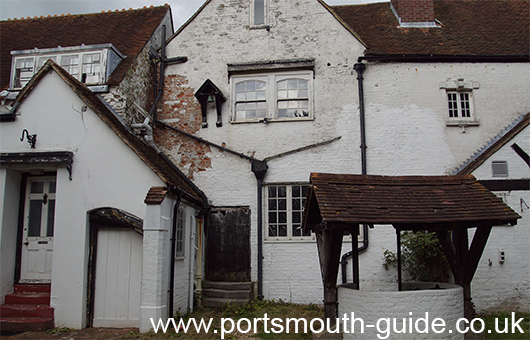 Wymering manor is a grade II listed building and is the oldest building in Portsmouth. In 1285 Edward I granted the manor to John le Botelier, in whose family it remained for a century; it then passed to the Waytes, from whom it passed in 1570 by marriage to the Brunnings,. The majority of the current building is 16th century. However there still exist parts that contain Roman and Medieval materials. Inside the manor is a spacious hall with a twin Jacobean staircase and gallery. The panelled walls and pilasters are in building styles associated with the Tudor Elizabethan period. There are also two priest-holes located in the house. On the death of Edward Bruning in 1707 the manor changed hands several times until in 1761 the Rev. Richard Harris Vicar of Wymering purchased it. Then in 1835 the house and land were sold to Mr John Martin for �000 before being sold again in 1858 to Rev. George Nugee and Mr. Thos. Thistlethwayte for �,827. 14s. 8d. The Reverend Nugee made major alterations to the manor, from which he ran a training college for overseas missions, as well as rebuilding Wymering Parish Church opposite. The Manor was purchased by Thomas Knowlys-Parr and his aunt Mrs Nightingale in 1899, who made a number of alterations, including the incorporation of features from Bold Hall near St Helen's in Lancashire, which was demolished in 1900, to complete the conversion of the manor into a country house by 1908. The British Army took possession of the manor following the death of Knowlys-Parr in 1938 for the duration of World War II. Local builders P.J.A. and G.A. Day purchased the property in 1946 before selling the house to Airspeed director and designer, Leonard Metcalfe who took up residence and made further alterations to the building, which was made Grade II listed in 1953, up until his death in 1958. A local campaign resulted in the property being purchased by Portsmouth City Council in 1960, financed by selling off two-acres of the gardens for house construction and leasing of the building to the Youth Hostel Association. The Manor was put up for sale by auction in London on 21 September 2010 but failed to meet its reserve price and then in January 2013 the council officially handed Wymering Manor over to The Wymering Manor Trust.